The report reviews, analyses and projects the E-CR Glass Fibers market for the period 2014-2022, globally and the regional markets comprising North America, Europe, Asia-Pacific and Rest of World in terms of volumes in thousand metric tons and value in USD million. 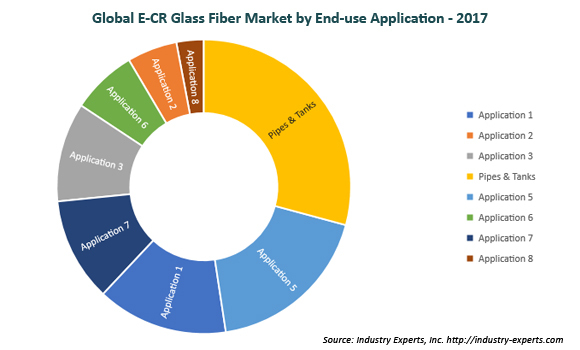 The global market for major applications of E-CR Glass Fibers analyzed in this report comprises Automotive & Transportation, Marine, Wind Energy, Pipes & Tanks, Building & Construction, Electrical & Electronics, Consumer Goods and Other applications.This global E-CR glass fibers market study includes 62 charts (includes a data table and graphical representation for each table), supported with meaningful and easy to understand graphical presentation, of market numbers. The report profiles 15 key global players across North America – 3; Europe – 2; Asia-Pacific – 8; and Rest of World – 2. The research also provides the listing of the companies engaged in E-CR glass fibers industry. The global list of companies covers the address, contact numbers and the website addresses of 27 companies.